In the Vendian Period (620-540 million years ago), worm burrows become increasingly numerous. Since just prior to the Vendian the only evidence for macroscopic life was that of the worms, if the various phyla were to evolve, it must have been from the worms. Many of the Cambrian creatures appear to be arthropods, the large classification of animals that includes insects, spiders, crabs, and lobsters. We can speculate on how these creatures evolved from the much simpler forms in the Vendian/Ediacaran era. It appears to be a 'worm' with legs, which are lobopods. A lobopod consists of muscles surrounding a blood-filled cavity. Lobopods are soft and pliable but they accomplish the purpose of moving the animal along. Each lobopod has a couple of claws at its end and the front two have spikes which apparently serve the purpose of grasping prey. 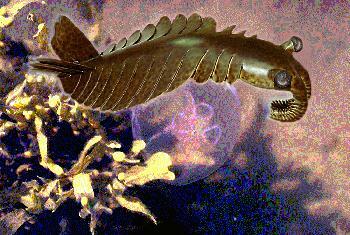 Thus Anomalocaris has traits that link it to the lobopods as well as to the arthropods. But it also has traits that link it to even more ancient ancestors. Its mouth is wormlike, with teeth radiating around the mouth itself. So, what we find in the fossil record are animals with all stages of the transition between worms and arthropods: 1. worms; 2. lobopods; 3. Anomalocaris with both lobopods and arthropod appendages and possible incipient arthropod gills; and 4. arthropods. Brachiopods are another distinct Cambrian animal form. The evolutionary lineage of the Brachiopods appears to begin with a creature called Halkieria Evangelista from the Sirius Passet formation of Greenland which is about 525 million years ago. The shells at the ends of Halkieria are very similar to the shells of the brachiopods seen in the earliest Cambrian strata. What is believed to have taken place is that the two shells at each end of Halkieria were used by this animal as protection devices. The animal would curl up between the plates when threatened. There are other facts that support this interpretation. The edges of brachiopod shells have bristles, called setae, which extend away from the shell. 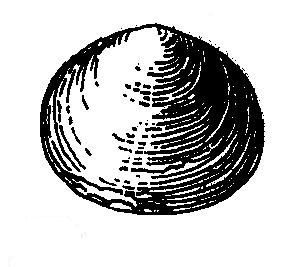 In some of the brachiopods the setae are segmented as is the case with Halkierian scales. And finally, "Neocrania", a modern brachiopod begins life as mobile animal that moves across the ocean floor, bearing the setae of a brachiopod but lacking the shell. Eventually it settles down, folds itself in the middle, secretes a shell and remains fixed like others of their kind. The most fundamental question about the Cambrian Explosion is why did it happen. There are many ideas, and of course it is possible that more than one of these effects worked together. 1. Climate Change - It appears that the period prior to the Cambrian era was marked by very cold temperatures. In fact, a somewhat controversial theory, termed "Snowball Earth," claims that there was so much ice that much of the sun light was reflected and we came close to entering an irreversible downward spiral in temperature as less and less of the sun's energy was absorbed by the surface of the planet. Thus, the Vendian/Ediacaran life forms would have been contending with very unfavorable conditions. Under this theory, the seeds of the Cambrian Explosion were planted during this earlier period, and when there were vast new possibilities for life in new and more favorable conditions, an explosion of new life forms occurred to fill these new niches. 2. Development of Predators - PreCambrian fossils show little evidence for predators. Clearly, predators were prevalent and highly dangerous to Cambrian life. Evolution responds to challenge. Predators require many adaptations to find their prey - ability to move rapidly toward a target without losing track of it, hunting strategies, grasping the prey - all of which would also lead to development of brains and advances in nervous systems. The necessity to fend off predators to survive would have also triggered a great acceleration in the rate of evolutionary change in other animals, including the development of protective outer armor (shells, or the scale-like structures and spines of the Wiwaxia). 3. 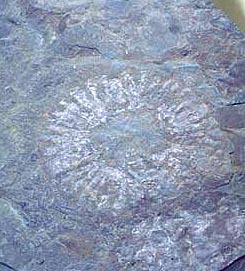 Evolutionary Breakthrough - Perhaps some new feature developed by chance during evolution of the precambrian life forms that provided a huge advantage. An example would be the development of an exoskeleton that would provide rigidity against which muscles could work, making it suddenly advantageous for complex animals to develop. 4. Changes in Ocean Chemistry or in Geography - The Cambrian occurred at the time plate tectonics were breaking up a super-continent, and also at a time when a large amount of phosphorus was being deposited on the shallow undersea shelves surrounding the continents. Phosphorus is an essential ingredient for life. Another twist is that the phosphorus was to abundant that animals had to fight being poisoned by depositing it into shells. Or perhaps some other chemical or geographical change helped trigger the explosion. 5. Rapid Climate Fluctuations - Marine sediments show 10 large oscillations during the Cambrian period in the amount of carbon 13, which we think indicates a series of global extinctions and recoveries. Perhaps the challenges of adapting to such a rapidly changing environment produced a period of evolutionary breakthroughs. Material from http://home.entouch.net/dmd/cambevol.htm, G. Morton; "Wonderful Life," S. Gould; "The Crucible of Creation: The Burgess Shale and the Rise of Animals," by S. Conway Morris; and "Evolving Brains," by John Allman..